Queen and Geary: Stopping is easy, getting across hard. 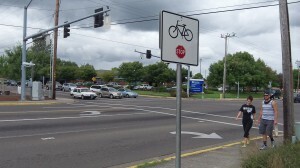 The “Oregon Drive Less Challenge” is coming up Oct. 21-Nov. 1, which brings me – again –to Albany’s Periwinkle Bike Path and a problem that keeps it from being as useful as it could be. Near its halfway point, though, there lies the intersection of Queen Avenue and Geary Street, and getting across is a challenge. From the north, the path hits Queen far short of the intersection. Cyclists have only bad choices: Cross the four lanes of Queen, which has rarely a gap in traffic; dismount and walk to the intersection; ride there on the narrow sidewalk and frighten the odd pedestrian; or ride on the street against traffic (the worst possible choice because it’s illegal). From the south, it’s almost as bad. 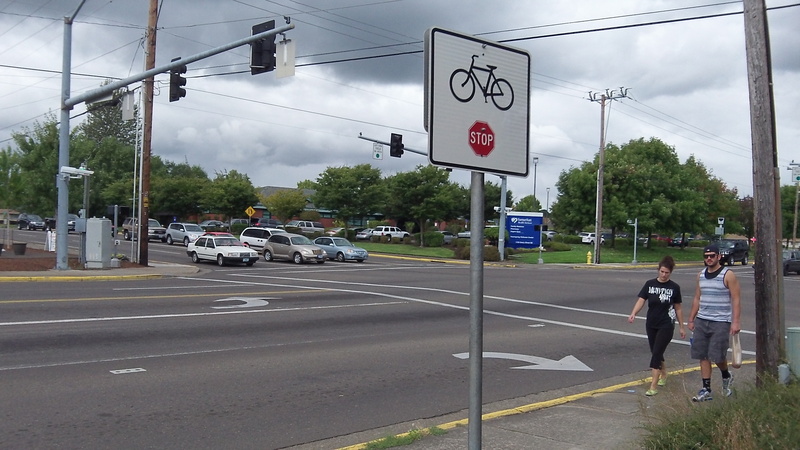 You pretty much have to dismount and cross on foot.